Grand Canyon University alumnus Tim Campbell stands at 17,200 feet on his way to the top of Denali, the tallest peak in North America. Grand Canyon University graduate Tim Campbell sets high goals. Really, really high. Like climbing 20,310 feet above sea level to North America’s highest peak. In June, the 2015 nursing graduate climbed to the peak of Denali, a rugged Alaskan mountain battered by ferocious weather. The climb up Denali meant surviving some tough weather. “I am very goal driven and was determined to get to the summit,” said the one-time horseshoer turned nurse. That’s exactly what Campbell, 58, did when he enrolled in GCU’s online nursing program. A graduate of a two-year community college nursing program, he decided to earn a bachelor’s degree to be able to move up into management. “A group of us at the hospital went through GCU together, and it was challenging but worth the effort,” said Campbell, now a nursing supervisor at a hospital in Yakima, Wash. While attending GCU and working as a nurse, the avid outdoorsman still found time to hike, hunt, fish and camp. After graduation, he began climbing mountains. In the last five years, he has reached the top of Mt. Shasta, Mt. Hood and all five Washington volcanoes – St. Helens, Rainier, Adams, Baker and Glacier. Preparing for Denali required more time and effort than any previous climb. 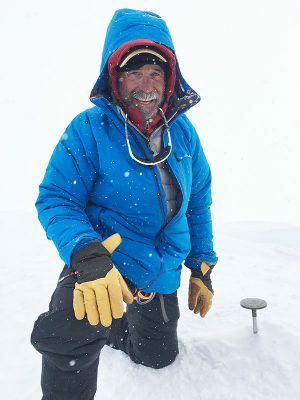 “I knew I needed to be in top shape for Denali, that I needed to be able to carry 128 pounds in supplies,” said Campbell, who prepared by spending last winter pulling a 50-pound sled for a total of 250 miles and snowshoeing with a 45-pound backpack. His rigorous training, however, failed to protect him from the unrelenting winds that nearly sabotaged his climb. 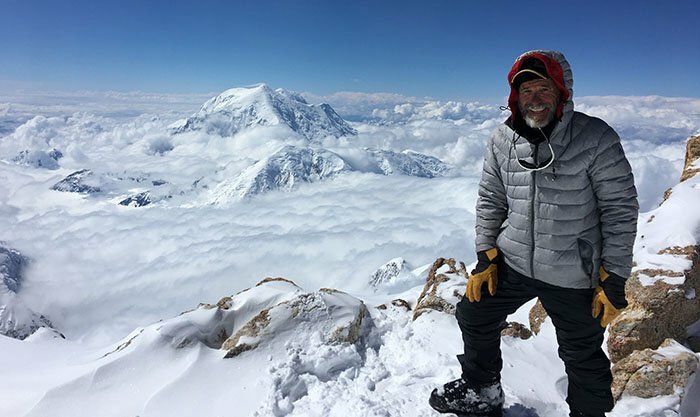 He and seven other climbers had hoped to reach the peak on Father’s Day but instead were forced to hunker down in Denali’s 17,200-foot camp waiting for the wind to die down. “I was really disappointed and figured I was not going to make it to the top. Our supplies were running low and I thought we might have to start down the mountain,” he said. Seventy percent of Denali climbers are waylaid by weather, and Campbell figured he would be one. That was until a sudden break in the wind and temperatures warming 20 degrees to a palatable 0 degrees Fahrenheit. Campbell’s group spent the next eight hours in near perfect conditions climbing to the peak, taking the West Buttress route up Kahiltna Glacier on the west slope of the towering mountain. On the top, he cried, shook hands with fellow climbers and took pictures he will cherish forever. The views were even more spectacular than he imagined. A happy dot. To celebrate, he called his girlfriend, Melanie Neddo, on a satellite phone. Turns out that Denali probably isn’t Campbell’s final climb. He’s trying to convince Neddo to climb Mount Kilimanjaro, the highest mountain in Africa, on his 60th birthday.